Explain Hooke’s law using graphical representation between deformation and applied force. Discuss the three types of deformations such as changes in length, sideways shear and changes in volume. Describe with examples the young’s modulus, shear modulus and bulk modulus. Determine the change in length given mass, length and radius. makes it clear that the deformation is proportional to the applied force. 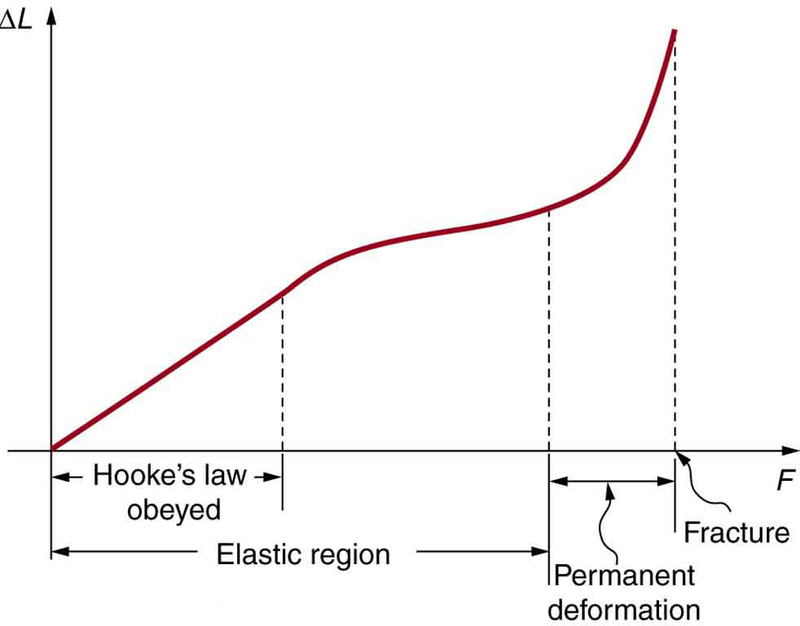 Figure 1 shows the Hooke’s law relationship between the extension of a spring or of a human bone. For metals or springs, the straight line region in which Hooke’s law pertains is much larger. Bones are brittle and the elastic region is small and the fracture abrupt. Eventually a large enough stress to the material will cause it to break or fracture. Tensile strength is the breaking stress that will cause permanent deformation or fracture of a material. where is the amount of deformation (the change in length, for example) produced by the force and is a proportionality constant that depends on the shape and composition of the object and the direction of the force. Figure 1. A graph of deformation ΔL versus applied force F. The straight segment is the linear region where Hooke’s law is obeyed. The slope of the straight region is 1 / k. For larger forces, the graph is curved but the deformation is still elastic—ΔL will return to zero if the force is removed. Still greater forces permanently deform the object until it finally fractures. The shape of the curve near fracture depends on several factors, including how the force F is applied. Note that in this graph the slope increases just before fracture, indicating that a small increase in F is producing a large increase in L near the fracture. Figure 2. The same force, in this case a weight (w), applied to three different guitar strings of identical length produces the three different deformations shown as shaded segments. The string on the left is thin nylon, the one in the middle is thicker nylon, and the one on the right is steel. How would you go about measuring the proportionality constant of a rubber band? If a rubber band stretched 3 cm when a 100-g mass was attached to it, then how much would it stretch if two similar rubber bands were attached to the same mass—even if put together in parallel or alternatively if tied together in series? We now consider three specific types of deformations: changes in length (tension and compression), sideways shear (stress), and changes in volume. All deformations are assumed to be small unless otherwise stated. Figure 3. (a) Tension. 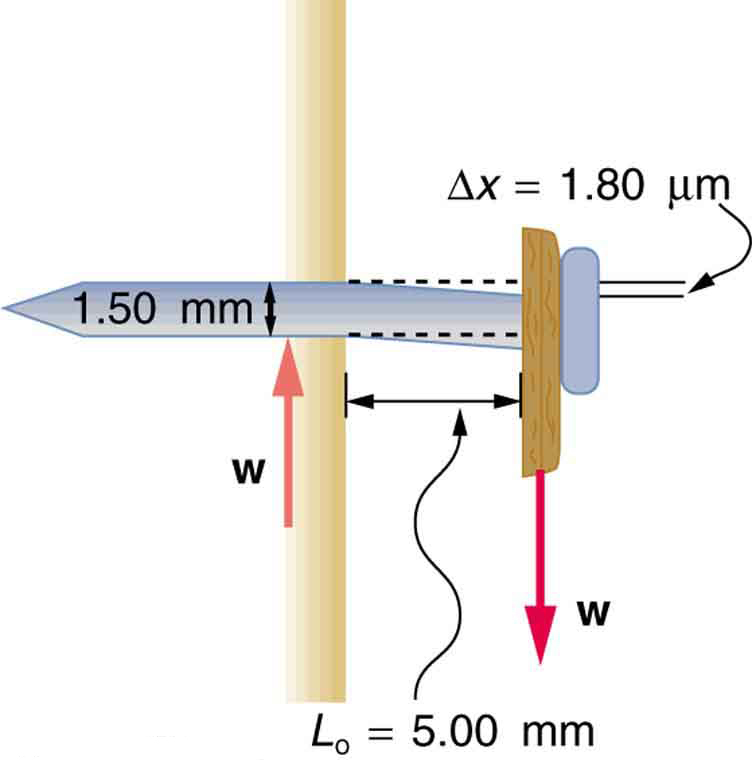 The rod is stretched a length ΔL when a force is applied parallel to its length. (b) Compression. The same rod is compressed by forces with the same magnitude in the opposite direction. For very small deformations and uniform materials, ΔL is approximately the same for the same magnitude of tension or compression. 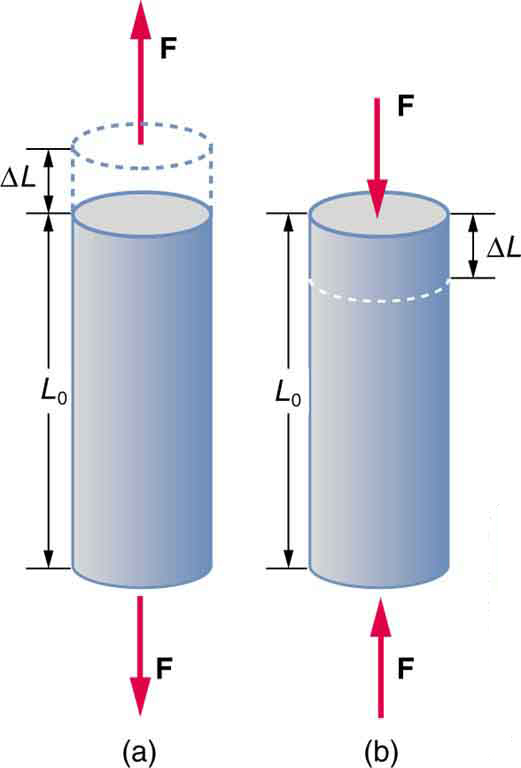 For larger deformations, the cross-sectional area changes as the rod is compressed or stretched. where is the change in length, the applied force, is a factor, called the elastic modulus or Young’s modulus, that depends on the substance, is the cross-sectional area, and is the original length. Table 3 lists values of for several materials—those with a large are said to have a large tensile stiffness because they deform less for a given tension or compression. The force is equal to the maximum tension, or The cross-sectional area is The equation can be used to find the change in length. This is quite a stretch, but only about 0.6% of the unsupported length. Effects of temperature upon length might be important in these environments. Bones, on the whole, do not fracture due to tension or compression. Rather they generally fracture due to sideways impact or bending, resulting in the bone shearing or snapping. The behavior of bones under tension and compression is important because it determines the load the bones can carry. Bones are classified as weight-bearing structures such as columns in buildings and trees. Weight-bearing structures have special features; columns in building have steel-reinforcing rods while trees and bones are fibrous. The bones in different parts of the body serve different structural functions and are prone to different stresses. Thus the bone in the top of the femur is arranged in thin sheets separated by marrow while in other places the bones can be cylindrical and filled with marrow or just solid. Overweight people have a tendency toward bone damage due to sustained compressions in bone joints and tendons. Another biological example of Hooke’s law occurs in tendons. Functionally, the tendon (the tissue connecting muscle to bone) must stretch easily at first when a force is applied, but offer a much greater restoring force for a greater strain. Figure 5 shows a stress-strain relationship for a human tendon. Some tendons have a high collagen content so there is relatively little strain, or length change; others, like support tendons (as in the leg) can change length up to 10%. Note that this stress-strain curve is nonlinear, since the slope of the line changes in different regions. In the first part of the stretch called the toe region, the fibers in the tendon begin to align in the direction of the stress—this is called uncrimping. In the linear region, the fibrils will be stretched, and in the failure region individual fibers begin to break. 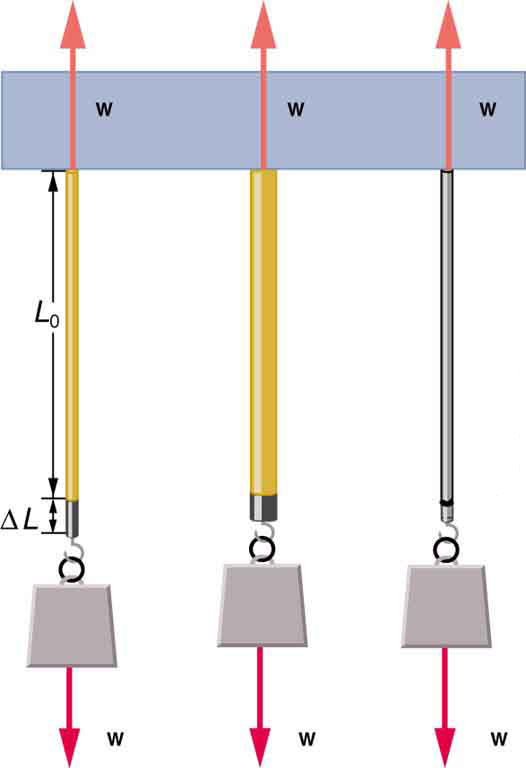 A simple model of this relationship can be illustrated by springs in parallel: different springs are activated at different lengths of stretch. Examples of this are given in the problems at end of this chapter. Ligaments (tissue connecting bone to bone) behave in a similar way. Figure 5. Typical stress-strain curve for mammalian tendon. 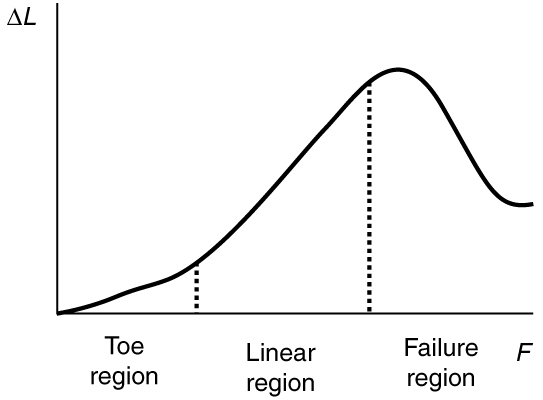 Three regions are shown: (1) toe region (2) linear region, and (3) failure region. Unlike bones and tendons, which need to be strong as well as elastic, the arteries and lungs need to be very stretchable. The elastic properties of the arteries are essential for blood flow. The pressure in the arteries increases and arterial walls stretch when the blood is pumped out of the heart. When the aortic valve shuts, the pressure in the arteries drops and the arterial walls relax to maintain the blood flow. When you feel your pulse, you are feeling exactly this—the elastic behavior of the arteries as the blood gushes through with each pump of the heart. If the arteries were rigid, you would not feel a pulse. The heart is also an organ with special elastic properties. The lungs expand with muscular effort when we breathe in but relax freely and elastically when we breathe out. Our skins are particularly elastic, especially for the young. A young person can go from 100 kg to 60 kg with no visible sag in their skins. The elasticity of all organs reduces with age. Gradual physiological aging through reduction in elasticity starts in the early 20s. Example 2: Calculating Deformation: How Much Does Your Leg Shorten When You Stand on It? Calculate the change in length of the upper leg bone (the femur) when a 70.0 kg man supports 62.0 kg of his mass on it, assuming the bone to be equivalent to a uniform rod that is 40.0 cm long and 2.00 cm in radius. and the cross-sectional area is The equation can be used to find the change in length. This small change in length seems reasonable, consistent with our experience that bones are rigid. In fact, even the rather large forces encountered during strenuous physical activity do not compress or bend bones by large amounts. Although bone is rigid compared with fat or muscle, several of the substances listed in Table 3 have larger values of Young’s modulus In other words, they are more rigid. This general idea—that force and the deformation it causes are proportional for small deformations—applies to changes in length, sideways bending, and changes in volume. The ratio of force to area, is defined as stress measured in N/m2. where is the shear modulus (see Table 3) and is the force applied perpendicular to and parallel to the cross-sectional area Again, to keep the object from accelerating, there are actually two equal and opposite forces applied across opposite faces, as illustrated in Figure 6. The equation is logical—for example, it is easier to bend a long thin pencil (small ) than a short thick one, and both are more easily bent than similar steel rods (large ). Figure 6. Shearing forces are applied perpendicular to the length L0 and parallel to the area A, producing a deformation Δx. Vertical forces are not shown, but it should be kept in mind that in addition to the two shearing forces, F, there must be supporting forces to keep the object from rotating. The distorting effects of these supporting forces are ignored in this treatment. 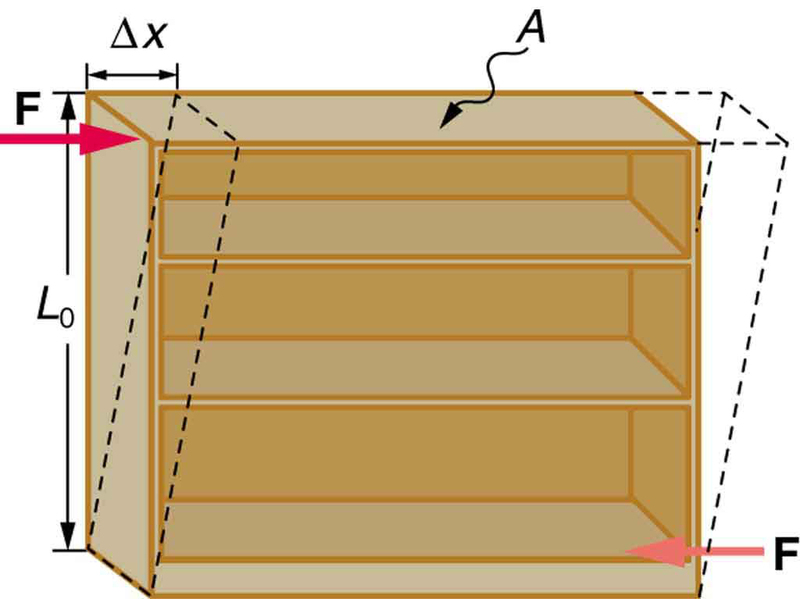 The weight of the object also is not shown, since it is usually negligible compared with forces large enough to cause significant deformations. Examination of the shear moduli in Table 3 reveals some telling patterns. For example, shear moduli are less than Young’s moduli for most materials. Bone is a remarkable exception. Its shear modulus is not only greater than its Young’s modulus, but it is as large as that of steel. This is why bones are so rigid. The spinal column (consisting of 26 vertebral segments separated by discs) provides the main support for the head and upper part of the body. The spinal column has normal curvature for stability, but this curvature can be increased, leading to increased shearing forces on the lower vertebrae. Discs are better at withstanding compressional forces than shear forces. Because the spine is not vertical, the weight of the upper body exerts some of both. Pregnant women and people that are overweight (with large abdomens) need to move their shoulders back to maintain balance, thereby increasing the curvature in their spine and so increasing the shear component of the stress. An increased angle due to more curvature increases the shear forces along the plane. These higher shear forces increase the risk of back injury through ruptured discs. The lumbosacral disc (the wedge shaped disc below the last vertebrae) is particularly at risk because of its location. The shear moduli for concrete and brick are very small; they are too highly variable to be listed. Concrete used in buildings can withstand compression, as in pillars and arches, but is very poor against shear, as might be encountered in heavily loaded floors or during earthquakes. Modern structures were made possible by the use of steel and steel-reinforced concrete. Almost by definition, liquids and gases have shear moduli near zero, because they flow in response to shearing forces. Figure 7. Side view of a nail with a picture hung from it. The nail flexes very slightly (shown much larger than actual) because of the shearing effect of the supported weight. Also shown is the upward force of the wall on the nail, illustrating that there are equal and opposite forces applied across opposite cross sections of the nail. See Example 3 for a calculation of the mass of the picture. This is a fairly massive picture, and it is impressive that the nail flexes only —an amount undetectable to the unaided eye. An object will be compressed in all directions if inward forces are applied evenly on all its surfaces as in Figure 8. It is relatively easy to compress gases and extremely difficult to compress liquids and solids. For example, air in a wine bottle is compressed when it is corked. But if you try corking a brim-full bottle, you cannot compress the wine—some must be removed if the cork is to be inserted. The reason for these different compressibilities is that atoms and molecules are separated by large empty spaces in gases but packed close together in liquids and solids. To compress a gas, you must force its atoms and molecules closer together. To compress liquids and solids, you must actually compress their atoms and molecules, and very strong electromagnetic forces in them oppose this compression. Figure 8. An inward force on all surfaces compresses this cube. 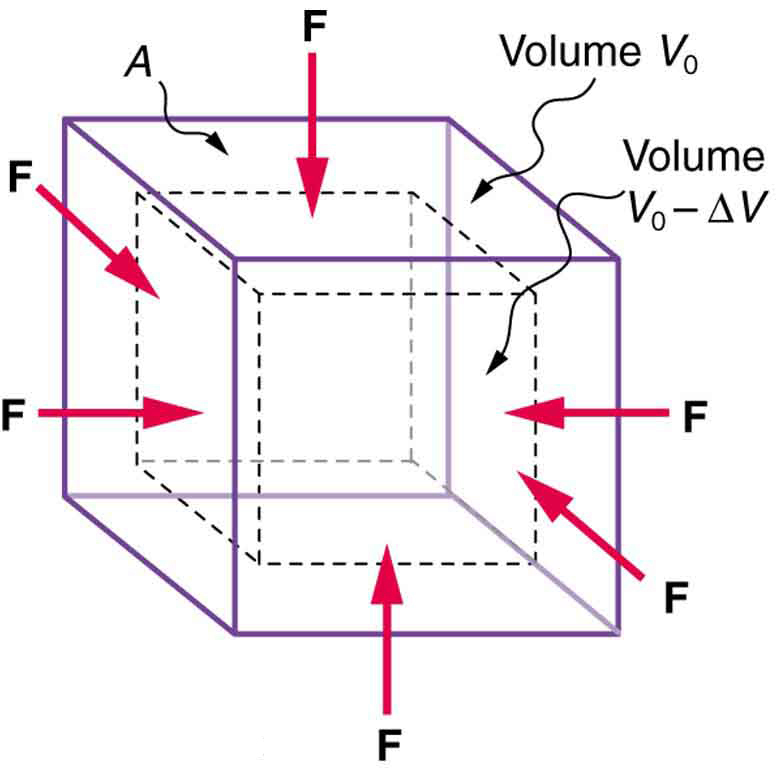 Its change in volume is proportional to the force per unit area and its original volume, and is related to the compressibility of the substance. where is the bulk modulus (see Table 3), is the original volume, and is the force per unit area applied uniformly inward on all surfaces. Note that no bulk moduli are given for gases. What are some examples of bulk compression of solids and liquids? One practical example is the manufacture of industrial-grade diamonds by compressing carbon with an extremely large force per unit area. The carbon atoms rearrange their crystalline structure into the more tightly packed pattern of diamonds. In nature, a similar process occurs deep underground, where extremely large forces result from the weight of overlying material. Another natural source of large compressive forces is the pressure created by the weight of water, especially in deep parts of the oceans. Water exerts an inward force on all surfaces of a submerged object, and even on the water itself. At great depths, water is measurably compressed, as the following example illustrates. Example 4: Calculating Change in Volume with Deformation: How Much Is Water Compressed at Great Ocean Depths? Equation is the correct physical relationship. All quantities in the equation except are known. Although measurable, this is not a significant decrease in volume considering that the force per unit area is about 500 atmospheres (1 million pounds per square foot). Liquids and solids are extraordinarily difficult to compress. Conversely, very large forces are created by liquids and solids when they try to expand but are constrained from doing so—which is equivalent to compressing them to less than their normal volume. This often occurs when a contained material warms up, since most materials expand when their temperature increases. If the materials are tightly constrained, they deform or break their container. Another very common example occurs when water freezes. Water, unlike most materials, expands when it freezes, and it can easily fracture a boulder, rupture a biological cell, or crack an engine block that gets in its way. Other types of deformations, such as torsion or twisting, behave analogously to the tension, shear, and bulk deformations considered here. where is Young’s modulus, which depends on the substance, is the cross-sectional area, and is the original length. The ratio of force to area, is defined as stress, measured in N/m2. where is the bulk modulus, is the original volume, and is the force per unit area applied uniformly inward on all surfaces. 1: The elastic properties of the arteries are essential for blood flow. Explain the importance of this in terms of the characteristics of the flow of blood (pulsating or continuous). 2: What are you feeling when you feel your pulse? Measure your pulse rate for 10 s and for 1 min. Is there a factor of 6 difference? 3: Examine different types of shoes, including sports shoes and thongs. In terms of physics, why are the bottom surfaces designed as they are? What differences will dry and wet conditions make for these surfaces? 4: Would you expect your height to be different depending upon the time of day? Why or why not? 5: Why can a squirrel jump from a tree branch to the ground and run away undamaged, while a human could break a bone in such a fall? 6: Explain why pregnant women often suffer from back strain late in their pregnancy. 7: An old carpenter’s trick to keep nails from bending when they are pounded into hard materials is to grip the center of the nail firmly with pliers. Why does this help? 1: During a circus act, one performer swings upside down hanging from a trapeze holding another, also upside-down, performer by the legs. If the upward force on the lower performer is three times her weight, how much do the bones (the femurs) in her upper legs stretch? You may assume each is equivalent to a uniform rod 35.0 cm long and 1.80 cm in radius. Her mass is 60.0 kg. 2: During a wrestling match, a 150 kg wrestler briefly stands on one hand during a maneuver designed to perplex his already moribund adversary. By how much does the upper arm bone shorten in length? The bone can be represented by a uniform rod 38.0 cm in length and 2.10 cm in radius. 3: (a) The “lead” in pencils is a graphite composition with a Young’s modulus of about Calculate the change in length of the lead in an automatic pencil if you tap it straight into the pencil with a force of 4.0 N. The lead is 0.50 mm in diameter and 60 mm long. (b) Is the answer reasonable? That is, does it seem to be consistent with what you have observed when using pencils? 4: TV broadcast antennas are the tallest artificial structures on Earth. In 1987, a 72.0-kg physicist placed himself and 400 kg of equipment at the top of one 610-m high antenna to perform gravity experiments. By how much was the antenna compressed, if we consider it to be equivalent to a steel cylinder 0.150 m in radius? 5: (a) By how much does a 65.0-kg mountain climber stretch her 0.800-cm diameter nylon rope when she hangs 35.0 m below a rock outcropping? (b) Does the answer seem to be consistent with what you have observed for nylon ropes? Would it make sense if the rope were actually a bungee cord? 6: A 20.0-m tall hollow aluminum flagpole is equivalent in stiffness to a solid cylinder 4.00 cm in diameter. 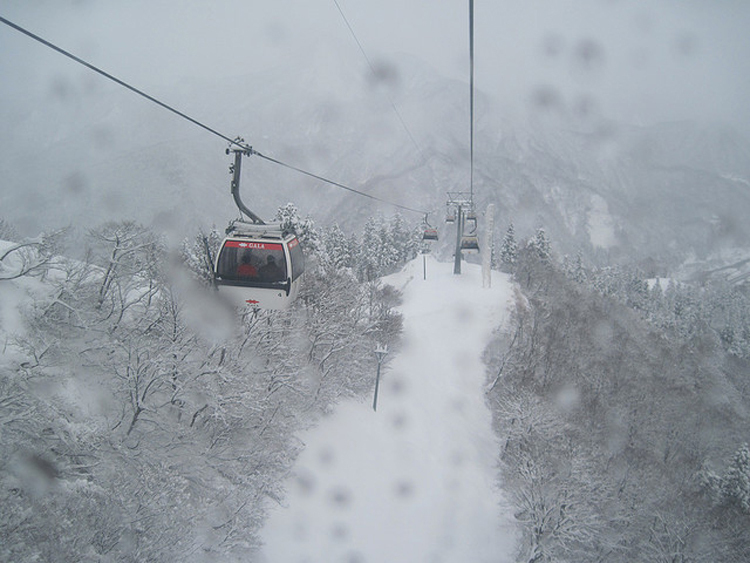 A strong wind bends the pole much as a horizontal force of 900 N exerted at the top would. How far to the side does the top of the pole flex? 7: As an oil well is drilled, each new section of drill pipe supports its own weight and that of the pipe and drill bit beneath it. Calculate the stretch in a new 6.00 m length of steel pipe that supports 3.00 km of pipe having a mass of 20.0 kg/m and a 100-kg drill bit. The pipe is equivalent in stiffness to a solid cylinder 5.00 cm in diameter. 8: Calculate the force a piano tuner applies to stretch a steel piano wire 8.00 mm, if the wire is originally 0.850 mm in diameter and 1.35 m long. 9: A vertebra is subjected to a shearing force of 500 N. Find the shear deformation, taking the vertebra to be a cylinder 3.00 cm high and 4.00 cm in diameter. 10: A disk between vertebrae in the spine is subjected to a shearing force of 600 N. Find its shear deformation, taking it to have the shear modulus of The disk is equivalent to a solid cylinder 0.700 cm high and 4.00 cm in diameter. 11: When using a pencil eraser, you exert a vertical force of 6.00 N at a distance of 2.00 cm from the hardwood-eraser joint. The pencil is 6.00 mm in diameter and is held at an angle of to the horizontal. (a) By how much does the wood flex perpendicular to its length? (b) How much is it compressed lengthwise? 12: To consider the effect of wires hung on poles, we take data from Chapter 4.7 Example 2, in which tensions in wires supporting a traffic light were calculated. The left wire made an angle below the horizontal with the top of its pole and carried a tension of 108 N. The 12.0 m tall hollow aluminum pole is equivalent in stiffness to a 4.50 cm diameter solid cylinder. (a) How far is it bent to the side? (b) By how much is it compressed? 13: A farmer making grape juice fills a glass bottle to the brim and caps it tightly. The juice expands more than the glass when it warms up, in such a way that the volume increases by 0.2% (that is, ) relative to the space available. Calculate the magnitude of the normal force exerted by the juice per square centimeter if its bulk modulus is assuming the bottle does not break. In view of your answer, do you think the bottle will survive? 14: (a) When water freezes, its volume increases by 9.05% (that is, ). What force per unit area is water capable of exerting on a container when it freezes? (It is acceptable to use the bulk modulus of water in this problem.) (b) Is it surprising that such forces can fracture engine blocks, boulders, and the like? 15: This problem returns to the tightrope walker studied in Chapter 4.5 Example 2, who created a tension of in a wire making an angle below the horizontal with each supporting pole. Calculate how much this tension stretches the steel wire if it was originally 15 m long and 0.50 cm in diameter. Figure 9. This telephone pole is at a 900 bend in a power line. 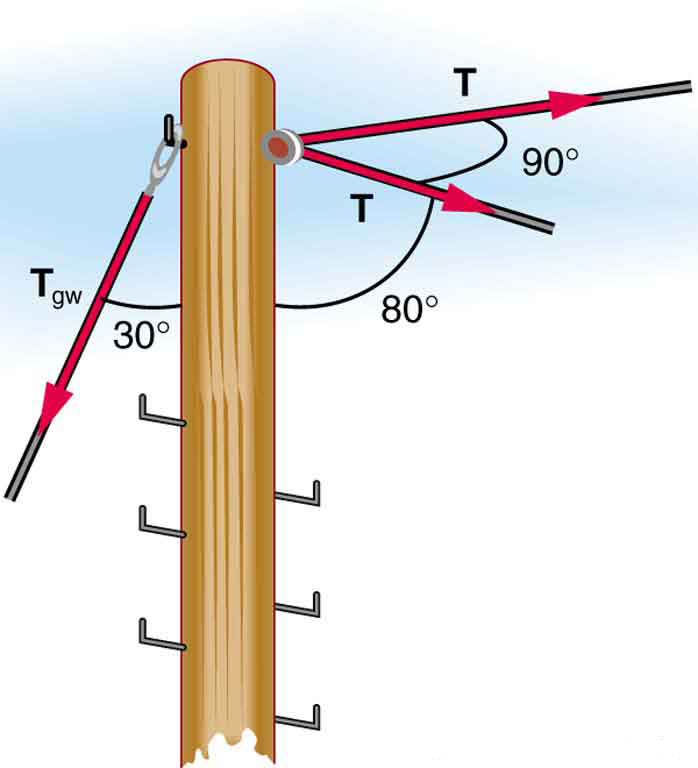 A guy wire is attached to the top of the pole at an angle of 300 with the vertical. 1 Approximate and average values. Young’s moduli for tension and compression sometimes differ but are averaged here. Bone has significantly different Young’s moduli for tension and compression. (b) This does seem reasonable, since the lead does seem to shrink a little when you push on it. (b)This seems reasonable for nylon climbing rope, since it is not supposed to stretch that much. This is about 36 atm, greater than a typical jar can withstand. 5.3 Elasticity: Stress and Strain by OpenStax is licensed under a Creative Commons Attribution 4.0 International License, except where otherwise noted.